For Erik Weihenmayer, blind at age 13, his messaging focuses on harnessing the power of adversity as an opportunity to problem solve and pioneer forward. He was the first blind person to scale Everest and has since scaled the 7 highest peaks. 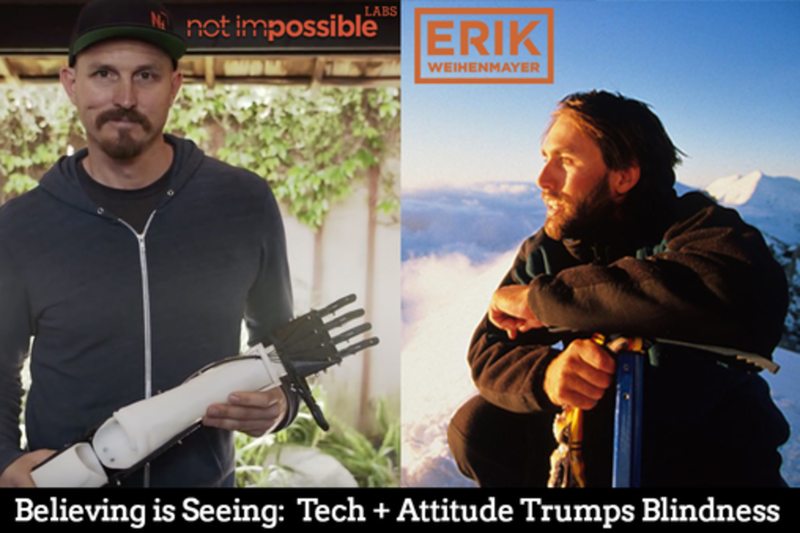 Paired with pioneering producer Mick Ebeling, founder of Not Impossible, they will explore what's now possible, and what is around the corner. Mick’s key mantra, "If not me, then who? If not now, then when? ", has helped create new technology and pushed the innovation around health care into unforeseen bounds. Mick Ebeling's ability to disrupt the status quo and challenge the pre-determined has set a new pace in the world of innovation. Erik Weihenmayer is one of the most celebrated and accomplished athletes in the world. In 2001, he became the only blind person in history to climb Mount Everest. When he stood on the top of Carstensz Pyramid in 2008, he completed his quest to climb all of the Seven Summits-the tallest peak on each of the seven continents. In September 2014, Erik and blinded Navy veteran, Lonnie Bedwell, kayaked the entire 277-miles of the Grand Canyon on the Colorado River, considered one of the most formidable whitewater venues in the world. Erik continually seeks out new adventures, focusing his efforts on empowering people traditionally swept to the sidelines of life. He founded an organization called No Barriers, which helps people with challenges tap into the human spirit, break through barriers, and contribute to the world. To celebrate the 10th anniversary of their Everest ascent, Erik and his team founded a new No Barriers program, No Barriers Warriors, which uses teamwork and the mountains as a transformative force to help veterans reclaim their lives after devastating injuries. Erik is the author of two best-selling books: his memoir, Touch the Top of the World and The Adversity Advantage, which offers lessons for turning challenges into greatness. He is an internationally recognized speaker and brings his message of living a No Barriers Life to audiences around the world. Honored as one of the Top 50 Most Creative People of 2014 and one of the 2014 Muhammad Ali Humanitarians of the Year, Mick Ebeling is a producer, philanthropist, technology trailblazer, author, entrepreneur and public speaker. Ebeling is CEO of Not Impossible Labs, an organization that develops creative solutions to address real-world problems. Not Impossible Labs was founded on the belief that nothing is impossible.Not Impossible's first project was the development of the award-winning ocular tracking device, The EyeWriter, which enables individuals with paralysis to communicate and create art using only the movement of their eyes. Time magazine called it one of the “Top 50 Inventions of 2010" and the device is now part of the permanent collection at the NY MOMA. Project Daniel enabled Ebeling to fly to Sudan to 3-D-print prosthetic limbs and fit them for children of the war-torn region.